The appearance of the Hardy Crocus is an encouraging sign that winter may be nearing an end. This flower will often push through a light layer of snow, as it searches for the spring sunshine. The crocuses appeared at the Leonard Rassi home this week on Indiana Avenue, as the snow melted away. 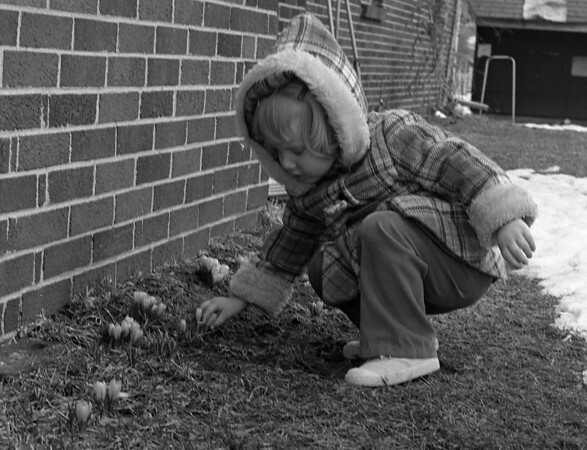 Pictured above is Vanessa Rassi, almost 3, who was visiting at her grandparents' home, and ventured outside to inspect the spring flowers. Vanessa is the daughter of Gary and Guanita Rassi, 58204 C.R. 23.